Hi everyone. I'm trying to date my lachenal (12732) but I can't find the database of serial numbers anywhere. Please could someone point me in the right direction? I'd love to learn more about my instrument so any other elevant resources that spring to mind would be great! All else the same, I simple would have estimated the year of manufacture as 1867 based on the serial number of No. 12732. And maybe that is a good estimate. But all is not the same: the problem is the label showing Lachenal & Co. The first English-system Lachenal in my database (having over 2300 entries) is No. 19070. All earlier ones for which I have information are labeled "Louis Lachenal, Patent Concertina Manufacturer." So your No. 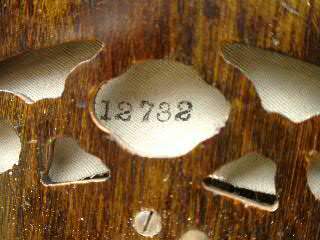 12732 may have been made in the mid-1860s and then had a post-1873 label substituted for the original label. Or is could have been made after 1873 but with a serial number corresponding to the earlier manufacturing period. Incidentally, does it have brass or steel reeds? Thanks for that. What you say rings a bell. It was reconditioned or serviced professionally just before I bought it and I think I remember being told the label was renewed. I'm not sure about the reeds - how might I tell? I wouldn't know by listening as I'm a complete beginner. I bought this shortly before having a brain haemorrhage which robbed me of some of my dexterity so I haven't really got into it yet and I wouldn't recognise the difference. Sadly I'll probably end up selling it but it'll be a shame because it's a lovely thing. The database has not been distributed. I am making extensive use of the data in the article on Lachenal production, which I am currently drafting. 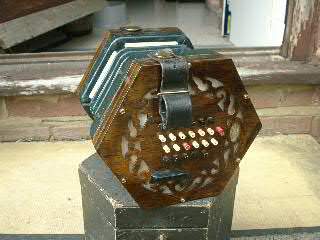 I should have indicated that, if you send me a serial number and description for your Lachenal concertina, I will gladly provide an approximate of the year of manufacture. It will be a while before I complete my article on Lachenal concertinas and the estimated manufacture dates. Thanks, Dowright. The serial number is 12732 but I'm wondering if the 3 is actually an 8. There are photos in the first post of this thread. We think the labels were renewed as part of the refurb and may not be the original ones. I would not be concerned if I could not tell if it is a 3 or an 8. For the last two digits of a serial number it is of no concern for estimating the year of manufacture if the digit is wrong. But it makes a total difference, of course, if someone is unsure about any of the first 2 digits of a 5-digit serial number, or any of the first three digits of a 6-digit Anglo number. Let's just say "127X2" where X is either 3 or 8. Could someone date my Lachenal EC from its' serial number please? It is 52593. According to the formulae I found on here that would make it 1918, but given that that would be at the end of WW1 would that make sense with the country on a war footing? it is not really a good idea to put too much store by the formulae devised by educated guesswork.... I know because I made some calculated guesses on this subject way back in the 70's and although others have made later and more accurate dating suggestions... it is rarely possible to really say, especially during the WW1 period. From the Wheatstone ledgers it can be seen that concertinas were made throughout that war and we can assume the case will be similar at Lachenal . 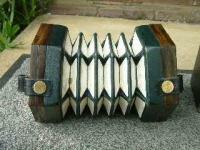 I would date your No 52593 Lachenal English concertina to circa 1911. Sure, it is tough to estimate the year of manufacture of Lachenals, but we do the best we can. I can tell you that my estimates are more accurate than what you find on the internet. And of course Lachenal (et al) operated during WW1. Thanks for the advice gentlemen. It's only a "student" model, with brass reeds sharp of concert pitch, but plays nicely. Interestingly it still has both its' cloth baffles, with the serial number stamped on in ink and an undamaged label. Would it be too cheeky to ask if you would please roughly date my own instrument in which I have just discovered the Serial Number stamped on the reed board. 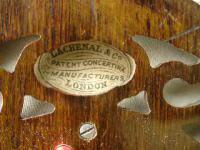 It is a Lachenal C/G 32 button Anglo with metal ends serial number 17618. Thanks and Best Wishes. Good luck with your Database and Lachenal article which will generate much grateful interest I'm sure. I estimate that it was made in about 1870. 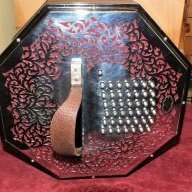 I am guessing that, in additon to metal fretwork, it has bone buttons, steel reeds, and 6-fold bellows--the same as 32-key No. 17733. Yours has (1) a Louis Lachenal label, (2) a third-party retailer's label, or (3) no label. Thank you very much Dowright. You are quite correct about bone buttons, steel reeds, and 6 fold bellows (although I think the present plain bellows are replacements). No labels though, long since gone I'm afraid. Thanks for your work on dating Lachenals. I would be grateful if you could give me a date for my English concertina; 60-key, raised metal ends and brass reeds. It has the number 47706 stamped into the left metal end and Lachenal on the right side. I have a receipt for No 48850, dated 5 Feb 1913, but am sure the it is for a second-hand Lachenal English. So the closest receipt that I have is 11 April 1904 for No 42146. Therefore, I date your No 47706 at circa 1908.